Beijing (AFP) – An official who was mayor of a northern Chinese city when a massive chemical explosion killed at least 165 people was Monday sentenced to 12 years in prison for graft, state media said. Huang Xingguo, 62, headed the response committee after the explosion rocked Tianjin in August 2015 and devastated a huge swathe of the port city. He was also acting party chief of the municipality at the time. Huang was sentenced for taking bribes of over 40 million yuan ($6 million) and fined three million yuan, the official Xinhua news agency said. “Between 1994 and 2016, Huang took advantage of his various posts to seek benefits regarding land using and personnel promotion for others,” it said, quoting a court statement. He also “used his power and status to seek illegal benefits for others through other officials”, it said, adding he had returned “all his illegal gains”. 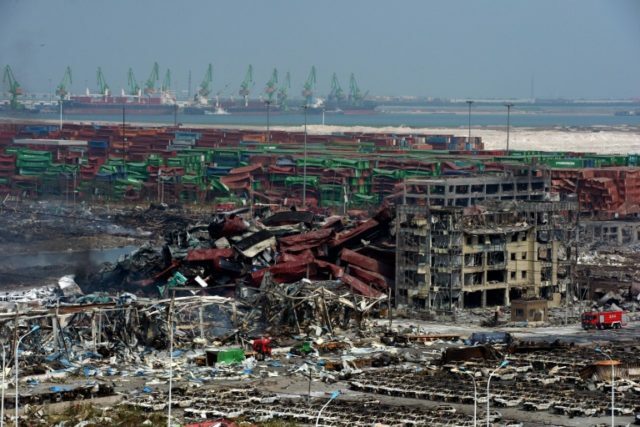 The report did not mention the Tianjin disaster, China’s worst industrial accident in years. Last November courts jailed almost 50 company managers and government officials over the deadly blasts on charges ranging from illegal storage of materials to abuse of power. A government report found that officials had routinely ignored or violated laws and regulations on chemical storage. Fears of toxic pollution were rife following the explosion, with cyanide levels in the disaster zone far above national limits.